Niue is a coral island without free-standing water, and nobody knows how Trevor got there. He found a small puddle, but it had to be continually topped up by the locals as it shrank. The Niue fire department then stepped in, adding water as needed. For a while Trevor was harassed by a rooster, but the antagonism seems to have stopped. In partnership with the stalwart Heather Hastie, a native Kiwi, I made efforts to get Trevor sent to New Zealand, where there’s plenty of fresh water and also potential mates, but that came to naught because New Zealand has strict regulations about what can be brought into the country—even an errant mallard. The government turned down my offer to help finance Trevor’s move to New Zealand. A voluntary group of Auckland Veterinarians, due on-island in October to deliver services for island pets and wildlife, have been asked by DAFF [Niue’s Department of Agriculture Forestry and Fisheries] to give the duck a health check. These arrangements should secure a safe future for the duck in Niue, allowing the local population, and interested tourists, to enjoy visiting Niue’s celebrity duck. On behalf of Rt Hon Winston Peters, Minister of Foreign Affairs, thank you for your follow-up email regarding the mallard duck in Niue. We understand that the duck was assessed by the visiting veterinarians who declared him fit and healthy. 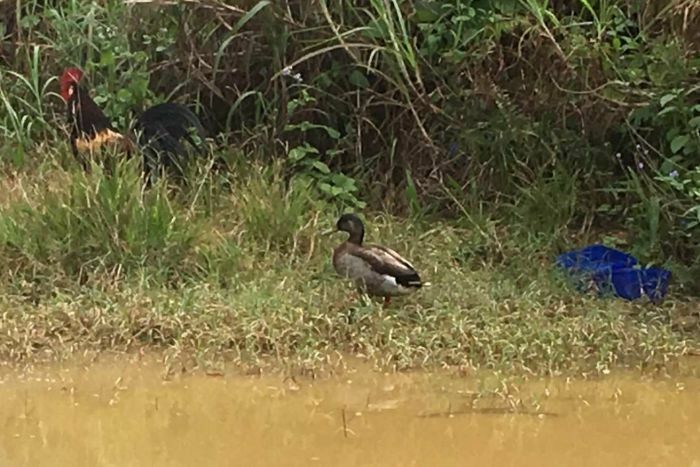 We have not received any update or other information from the Premier or Niue’s Department of Agriculture Forestry and Fisheries (DAFF) regarding the mallard duck, but trust that DAFF are taking steps that are appropriate in the circumstances. I’m glad, then, that Trevor is well, but of course he’s still lonely, and the Puddle Problem remains. But the people of Niue have taken to Trevor, for publicity about “the world’s loneliest duck” has been worldwide, and Trevor even has his own Facebook page. Judging by the video entry on December 18, things are looking ducky. But I’m sure the lad would like the company of a mallard hen. This entry was written by whyevolutionistrue and posted on January 16, 2019 at 6:00 pm and filed under ducks. Bookmark the permalink. Follow any comments here with the RSS feed for this post. Both comments and trackbacks are currently closed. Donald was a more complex character, prone to both fits of rage and sentimentality, and he spoke complete, sensible english sentences. And then there was his whole clan and social circle — Huey, Louie, Dewey, Scrooge McDuck, Gladstone Gander, Gyro Gearloose, and, of course, Daisy. Donald and Mickey had a complex relationship — great friends at times, but in later life troubled by professional jealously. A kiddie pool might make the Puddle Problem a bit easier to manage. Yeah, I thought of that, but it would have to be a BIG pool and also be cleaned out regularly–an onerous job. The water might get too hot, and be difficult for Trevor to get in and out of too because of the heat on the plastic. Niue is a tropical island and the ground is hard-baked. There’s very little soil – just a small layer on top of coral so the water stands better than it would most places. This is so great. Go, Trevor! Yes, ‘harassed by a rooster’ would almost fit into Pirates of Penzance — apprenticed to a pirate!